Bamboo baseboards, also known as wall base, are used to cover the lowest part of an interior wall. These baseboards also serve to cover the expansion gap that is required between the floor and the wall. On our site you'll find bamboo baseboards in a wide range of styles suitable for any decor. 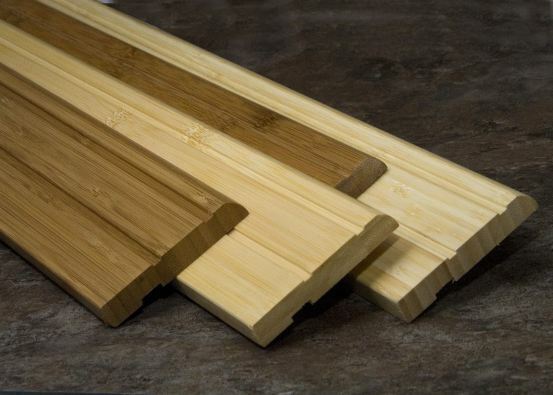 Our bamboo baseboards are available in many colors including classic and strand woven bamboo. Classic bamboo is a quality option for budget-conscious consumers, with the unique look of bamboo and benefit of eco-friendliness. You can specify whether you want a vertical or horizontal grain. Stand woven bamboo, our premium offering, combines beauty, strength and durability and is formed using a unique process for unsurpassed strength and a look that replicates the grain of traditional hardwood. Carbonization is heat treating process that causes no structural disadvantages, it simply results in a darker hue some prefer. Natural bamboo is blonde in color. Installing our bamboo baseboards is simple and requires no special tools. You can install our bamoo baseboard with a micro-pin nailer, or with adhesive, simply fix the molding in place with a non-water-or-latex-based adhesive. Pre-drilling may be required to nail strand bamboo wall base.